WordPress is one of the most popular platform for Blog Just because WordPress is very SEO Friendly and is fully customized. Ping Service is used to Index your Blog at faster rate suppose if your blog takes too much time to Index it in Google then its time to make changes to your Ping list. I promise you this Ping List is the optimal ping list service all ping service providers are included. WordPress Ping List is the must need for every WordPress blogger which will submit your new post to all the major Search engine which will increase your traffic to your Blog. 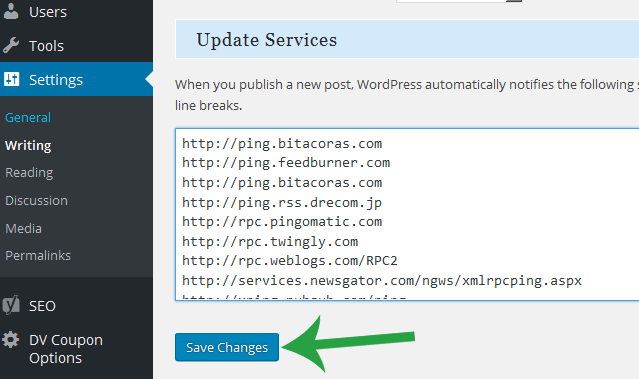 Just Goto Settings >> Writing >> at bottom you will find Update Services, Now you just need to copy and Paste it in text box. comment below with your email id and we will send you the latest wp ping list.